Try a Free Sample and Subscribe Today! Practical strategies and proven techniques from leading authorities on youth at risk are the watchwords of this journal, which puts readers on the cutting edge of positive youth development. 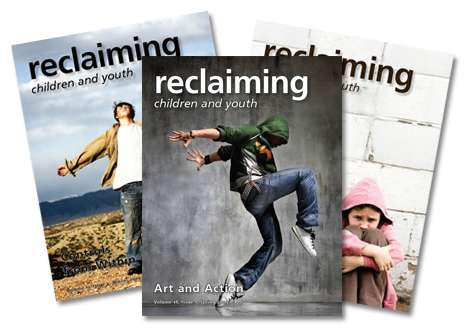 Since 1992, Reclaiming Children and Youth has spotlighted and advanced the experiences and teachings of those among us who bring their professional voices to describe the real-life challenges for youth at risk and the dedicated people who serve them so effectively. In each issue you'll find positive, strength-based assessments and support built on the inherent resilience of children and youth described by practitioners. Regular features include Spotlight on Excellence, Voices of Pioneers, Voices of Youth, Children on the Edge, Reclaiming World Wide, and current book reviews.